Saturn's A ring appears bright compared to the thin F ring, which is shepherded by the moon Prometheus, in this view from the Cassini spacecraft. Prometheus can be seen near the F ring on the middle right of the image. The gravity of potato-shaped Prometheus (86 kilometers, or 53 miles across) periodically creates streamer-channels in the F ring, and the moon's handiwork can be seen faintly on the right. To learn more and to watch a movie of this process, see PIA08397. 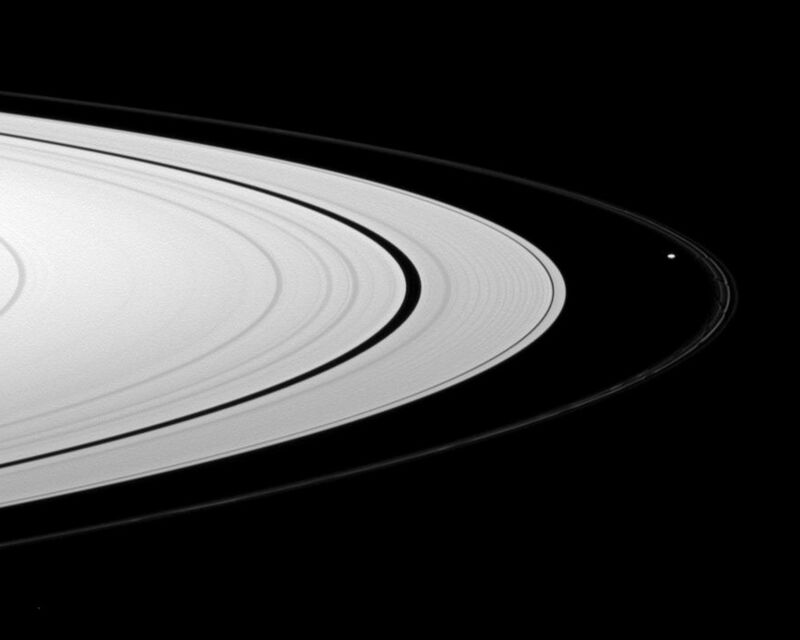 This view looks toward the northern, sunlit side of the rings from about 5 degrees above the ringplane. A star is visible in the lower left of the image. The image was taken in visible red light with the Cassini spacecraft wide-angle camera on Jan. 27, 2010. The view was obtained at a distance of approximately 322,000 kilometers (200,000 miles) from Prometheus. Image scale is 19 kilometers (12 miles) per pixel.